MYTHS...& HIM: Williamson songwriter Adam Guettel is flying high this spring...In February his musical, FLOYD COLLINS, written with Tina Landau, was staged by Landau at San Diego's Old Globe Theatre, followed by equally well-received engagements at the Prince Music Theater in Philadelphia and the Goodman Theatre in Chicago; plans are under discussion to bring FLOYD COLLINS back to New York (where it won the 1996 Lucille Lortel Award for Best Musical) later this year...Meanwhile, FLOYD COLLINS will have its U.K. premiere at London's Bridewell Theatre this summer...In March, Nonesuch released a sumptuously packaged CD of MYTHS & HYMNS (based on material from SATURN RETURNS; see Happy Talk, Vol. 5, No. 3), featuring the vocal talents of Audra McDonald, Mandy Patinkin, Billy Porter, Annie Golden and Guettel himself, among others...Guettel also appeared in three high-profile concerts this spring: at a February tribute to his grandfather, Richard Rodgers, Guettel took to the stage alongside such luminaries as Harolyn Blackwell, Faith Prince, Mary Cleere Haran and Howard McGillin to sing ""Glad To Be Unhappy""; in early May, he appeared with Audra McDonald at her Town Hall recital, and a week later she returned the favor at his Town Hall concert, joining the composer and other guest artists in an evening the New York Times called ""triumphant""... Guettel is currently working with Tony, Oscar and Pulitzer Prize-winner Alfred Uhry on a new musical, THE LIGHT IN THE PIAZZA. ALL AT ONCE: Concert versions of Rodgers & Hart musicals are popping up on both coasts, and on both sides of the Atlantic...In February, the hottest place to be in cold New York was City Center, where the sixth season of Encores! 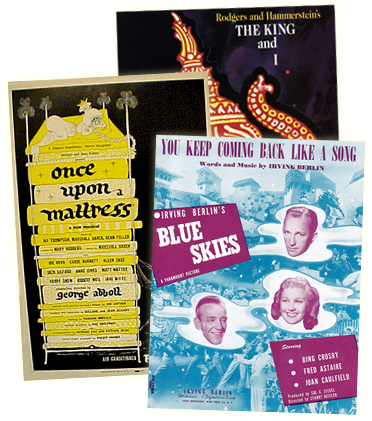 Great American Musicals in Concert kicked off with a high-spirited BABES IN ARMS (deemed ""almost too enjoyable for a theatregoer's good"" by the New York Times), and broke all box office records for the already popular Encores! series...Directed and choreographed by Kathleen Marshall with the book adapted by John Guare, and musical direction by Rob Fisher with the Coffee Club Orchestra, it featured a truly youthful cast of new faces, including David Campbell, Erin Dilly and Melissa Rain Anderson, each of whom belted their showstoppers like home run champs at Yankee Stadium...This summer, Ian Marshall Fisher's Lost Musicals series in London presents the FDR-era political satire I'D RATHER BE RIGHT at the Fortune Theatre, while in the fall on the West Coast, Los Angeles' Reprise! will stage THE BOYS FROM SYRACUSE, book adapted by David Ives (Sept.22-Oct. 3), and San Francisco's 42nd Street Moon will present BABES IN ARMS (Nov. 26-Jan. 2). OKLAHOMA! - OK: After a six-month limited run in the West End, the hit London production of OKLAHOMA! closed in late June, but not before racking up more prizes than Will Parker at a rodeo...The Cameron Mackintosh presentation of the Royal National Theatre's production earned a record-setting four Olivier Awards, including Best Musical Production (accepted by director Trevor Nunn), Best Theatre Choreographer (Susan Stroman), Best Set Design (Anthony Ward) and Best Supporting Actor in a Musical (for Shuler Hensley's haunting portrayal of Jud Fry)...During its West End stay, OKLAHOMA! also received the London Critics' Drama Award and the Evening Standard Award for Best Musical ... Between its Summer '98 SRO run at the RNT (see Vol. 6, No. 1) and its move to the West End, OKLAHOMA! was filmed at Shepperton Studios in 35mm widescreen, and will be seen on Britain's SKY-TV later this year. KW 100 IN Y2K: The centennial of R&H Theatre Library's Kurt Weill in 2000 is being celebrated worldwide by festivals, orchestras and theaters, from Tel Aviv to Tokyo, from Munich to Minneapolis...In anticipation, summer '99 will see productions of STREET SCENE, the powerful Weill-Langston Hughes-Elmer Rice opera, by Denver's Central City Opera, the Chautauqua Opera, Colorado Opera Festival and Des Moines Metro Opera...In September, San Francisco's acclaimed American Conservatory Theatre will open their season with the Weill-Brecht masterpiece, THE THREEPENNY OPERA (see Vol. 5, No. 3), and next season's Lost Musicals concert series in London could see Melissa Errico repeating her Encores! triumph in ONE TOUCH OF VENUS ...For a comprehensive schedule of upcoming Weill events worldwide, visit The Kurt Weill Foundation For Music at www.kwf.org, or link from the Weill bio page at www.rnh.com. RADIO DAYS: Irving Berlin and Moss Hart's revue AS THOUSANDS CHEER, first presented in 1933, was revived to great acclaim by the Drama Dept. in 1998 (see Vol. 6, No. 1), and will now travel to the airwaves with an international radio broadcast, scheduled for later this summer...Presented by Voice of America Theatre in conjunction with L.A. Theatre Works, to be transmitted worldwide by VOA, AS THOUSANDS CHEER will be hosted by Kitty Carlisle Hart, with newcomers Thom Sesma and Nancy Johnston joining New York cast members Mary Beth Peil, Kevin Chamberlin, Paula Newsome and Howard McGillin, re-creating Hart sketches alongside such Berlin standards as ""Heatwave"" and ""Harlem on My Mind""... Var?se Sarabande released the Drama Dept. cast recording in April...This topical yet timely revue is now available for production from The R&H Theatre Library. COMING TRUE: New York's Vineyard Theatre hosted the world premiere of DREAM TRUE earlier this spring, a new musical by Williamson Music's Ricky Ian Gordon and R&H Theatre Library's Tina Landau... Winner of both the Richard Rodgers Production Award (administered by the American Academy of Arts & Letters) and the Jonathan Larson Foundation Award, DREAM TRUE sported a dream cast headed by Judy Kuhn, Jeff McCarthy and Daniel Jenkins... Upcoming for Gordon: ""Night Flight to San Francisco,"" the setting of a monologue from Tony Kushner's epic ANGELS IN AMERICA, to be premiered by soprano Rene Fleming, plus a new opera for Seattle Opera and a new musical for New York's Public Theatre...Gordon is also working on an album for Nonesuch Records. BERLIN BIO: In addition to the recent spate of written biographies (see below), Irving Berlin will be profiled in a major two-hour television documentary produced by and for A&E's BIOGRAPHY series...Chronicling his remarkable century-long life and career, with copious interviews and archival footage, the Berlin bio is produced by Michael Epstein, with Susan Leventhal as Executive Producer, and will air later this year. IF IT AIN'T GOT THAT SWING: Looking for help with your golf swing? Tom Watson in the June issue of Golf Digest has this helpful tip, inspired by golf pro David Duval: ""The one thing that impresses me most [with Duval's swing] is his rhythm...He has what I've always liked to refer to as 'Edelweiss' tempo... 'Edelweiss' is the name of a song that Captain von Trapp sings in THE SOUND OF MUSIC. The first syllable takes Duval about halfway to the top of his swing, the second syllable to the top, and the third syllable down to impact... It's a rhythm that's smooth and very forgiving...""
A LOVELY NIGHT: On March 29, New York City Center's annual gala paid tribute to the Chairman of the Encores! Advisory Committee (and our Prez), Theodore S. Chapin. Julie Andrews presented Ted with the City Center/Leonard Harris Award, and Schuyler Chapin, in dual capacity as Commissioner of Cultural Affairs for the City of New York and as father of the honoree, read a Mayoral proclamation declaring ""Theodore S. Chapin Day."" Over $550,000 for City Center's arts programs was raised from the proceedings. I COULD WRITE A BOOK: Joining Mary Ellin Barrett's book on her father, IRVING BERLIN: A DAUGHTER'S MEMOIR (Limelight) are two new Irving Berlin biographies: Philip Furia's A LIFE IN SONG (Schirmer) and Edward Jablonski's AMERICAN TROUBADOUR...Musical theatre historian Max Wilk has just published OVERTURE & FINALE (Back Stage Books), subtitled ""Rodgers and Hammerstein and the Creation of Their Two Greatest Hits,"" chronicling the creation of OKLAHOMA! and THE SOUND OF MUSIC...Charmian Carr, Liesl in the immortal '65 movie version of THE SOUND OF MUSIC, has written a memoir of that time; FOREVER LIESL will be published by Viking Penguin in February 2000...New songbooks from Williamson Music include: souvenir folio editions inspired by current revivals of ANNIE GET YOUR GUN and THE SOUND OF MUSIC, CINDERELLA (from the hit '97 TV broadcast starring Brandy and Whitney Houston), a children's songbook based on the recent animated version of THE KING AND I, and THE RODGERS & HAMMERSTEIN ILLUSTRATED SONGBOOK, co-published with Hal Leonard and Rizzoli/Universe, and featuring a Foreword by Andrew Lloyd Webber.